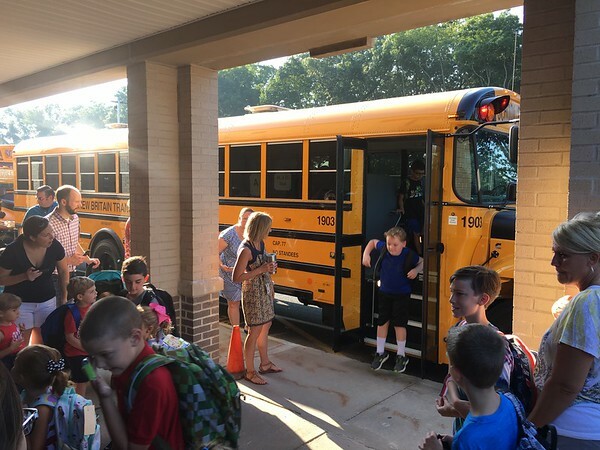 BERLIN - Emotions were on full display at Griswold Elementary School Wednesday morning for the first day of school and the end of summer vacation. “It’s kind of a bittersweet day,” said Chris Meyers, who was his two sons, Reid and Brennan, after they’d gotten off the bus. It was the first-ever school day for Reid, who is entering kindergarten, while Brennan is a fourth-grader. Meyers had been there on Brennan’s first day, too. “You’re obviously excited for them to enter but it’s also sad. It’s a sign that they’re maturing, getting older, moving on. … When your youngest gets to school age, you know the years are going to start going fast,” said Meyers. Central office staff traveled to all five schools in the Berlin district, with the first stop at Berlin High School. “I think it’s awesome,” BHS Principal Eileen Eustis said of the first-day tradition. Eustis is beginning her first year as principal of the high school after serving as an assistant principal at Simsbury High School and West Hartford’s Conard High School. “We’ve been having a great first day so far,” she said in the afternoon with about an hour left in the school day after having checked in with some of the classes and holding an introduction meeting with the senior class. Each class will be having a meeting this week, she said. Eustis said she is committed to figuring out which way she wants to lead the high school in collaboration with the faculty and staff, students, families and community. A meeting with class officers, the National Honor Society and other student organizations was held last Friday, she said, and the goal of students wanting to be more familiar with administrators was discussed. Working toward that goal, and the upcoming New England Association of Schools and Colleges 10-year accreditation process in October are what she’s focusing on, she said. Also new to the district is Erin McGurk, the assistant superintendent for curriculum and instruction, who comes from the same position in Ellington. The Berlin tradition of having central office employees visit all the schools was new to her, and she enjoyed it. McGurk said the district will be teaching this year with three overarching themes: Purpose, passion and pride. In other words: making sure instruction is meaningful, captures the passion of teachers and staff, and builds upon the larger sense of pride in the town. That goes along with several “learner outcomes” the district will be working to see students achieve: becoming kind, compassionate citizens; communicators; collaborators; innovators and more. “All those are relevant in what you do” whether that’s going to college or right into the workforce, said Superintendent of Schools Brian Benigni. Also new in his position is Jeff Cugno, director of business operations, a former member of the Board of Education. “It’s always a fun time to see the kids on the first day of school,” said Cugno, who added that he’s celebrated the first day of school both as a parent and a school board member. Returning this year is a full-time school resource officer at McGee Middle School, albeit with the understanding that the officer may return to regular duty if Police Chief John Klett is short, Benigni said. “It was one of the smoothest (first days) I can remember,” Benigni said. Posted in New Britain Herald, Berlin on Wednesday, 29 August 2018 21:19. Updated: Wednesday, 29 August 2018 21:21.